Adventurer, Adam Chase, explores the Central Coast and tells you all the great local spots in this slice of heaven we call home. This article has been republished with permission from the author and appears in full at backcountry.com. When you boil it down, runners are travelers. We move through space faster than walkers and hikers and, at times, we venture to different parts of the world to run on new roads and trails. Running away from home, or, rather, running while traveling, is somewhat of an acquired skill and this guide provides some shortcuts and does so contextually, in the central coast of California. Highway 1 Discovery Route is to roads what many of the trails in communities along the scenic coastal drive are to running trails: they are both iconic. As such, the region provides an excellent example of how to shape your next active vacation, one that balances a generous amount of running with relaxing activities that let you experience the destination while also replenishing your vacation-needing, hungry and thirsty self. One of the best things about California Highway 1 Discovery Route is that it offers so many destinations, including Avila Beach, Los Osos/Baywood, Morro Bay, Cayucos, Cambria, and Ragged Point/San Simeon. It is a veritable smorgasbord of outdoor activities with plenty of trail running delicacies. Traveling runners know that asking a hotel concierge where to run frequently results in sidewalk-heavy runs that are too short and too trafficked. While a run can’t really be too safe, that is essentially what you’ll get from such a source. The better routes, however, are located through social media, local run clubs, specialty running retailers or by asking real runners where to go. Strava, Suunto’s Movescount and other GPS-based technologies are another source, through a feature called “heat-mapping” that allows you to see the most frequently used roads and trails in a particular area. Strava also offers “Segment Explorer” to highlight the area’s challenges where runners virtually race one another on local roads and trails, noting the fastest times for those routes. Inquiring at a running shoe store is one of the best ways to get hooked up with an ideal running route, as is finding the area’s running clubs and joining them for a run. You can also check in with the region’s hiking and biking groups, especially if they have websites with maps. In the San Luis Obispo area, there plenty of available resources. Race SLO recently put on the first SLO Ultra, a 50-miler with other shorter races offered, too. The race director, Samantha Pruitt, is a wealth of knowledge when it comes to advice and recommendations. She sings the praise of Central Coast Concerned Mountain Bikers (CCCMB), an outstanding organization whose website is a wealth of information, with maps and more and, more importantly, they go to tremendous lengths to build and maintain sustainable, scenic and friendly trails in the region. Dave Peter, who owns the Galley Seafood Grill & Bar, is the unofficial “Mayor of Running” when it comes to his hometown of Morro Bay. Ask David and he’ll dial you in for the perfect run in Morro Bay State Park, up and down Black Hill, the Morro Rock area, any of the other Nine (or Seven, really) Sisters, the volcanic chain of mounts that runs east-west through San Luis Obispo County, or, just south of Morro Bay, in Los Osos, Montana de Oro State Park boasts some tremendous well-maintained trails with spectacular Pacific views. 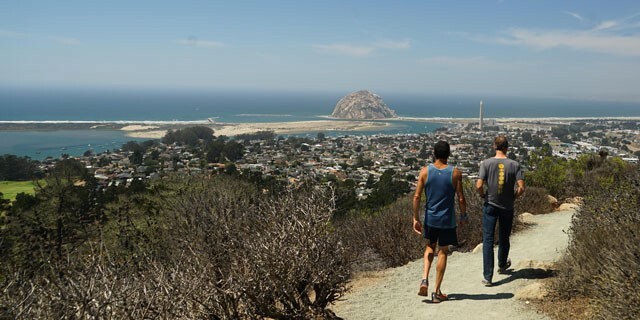 In addition to those mentioned above, such as Black Hill, a rather chill 3-mile trail to the summit from the Morro Bay campground in Morro Bay State Park that provides a great vantage point for plotting other runs in the area, there are some wonderful options for trail running in the Central Coast region. If you enjoy running on the beach, you can check out the half marathon “Rock to Pier” course that runs from Morro Bay’s famed Morro Rock to the recently-restored Cayucos Pier along the miles of beautiful beach at low tide. Be sure to check the tide chart for ideal timing. Between Avila Beach and San Luis Obispo, the trail running in Irish Hills and Johnson Ranch, with a short connector trail, is a delight that CCCMB has made all the better, especially with runnable switchbacks and the fact that the organization provides bells for mountain bikers to carry as warning to pedestrian users. The views from these trails are fantastic. 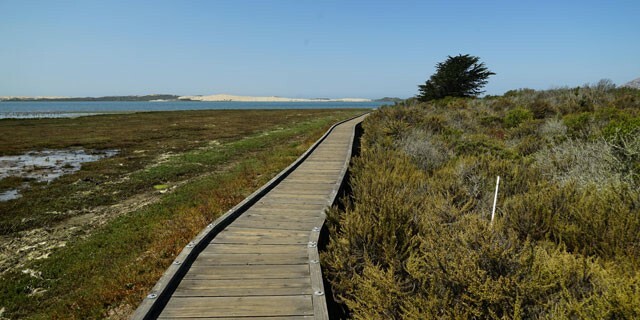 Similarly, the trails in Morro Bay State Park are well maintained and offer tremendous ocean vistas and vantage points of and from the Nine Sisters. As a cool down or warm-up, you can run the boardwalk of the Marina Peninsula Trail which starts at the south end of the Back Bay Marina for a little less than a mile overlooking the estuary with great wildlife viewing. For a paved bike path that makes for some cruiser miles, the Bob Jones Trail runs along Avila Creek and out to the Harford Pier from Avila Beach to near San Luis Obispo so you can get up to 8 miles of car-free running. 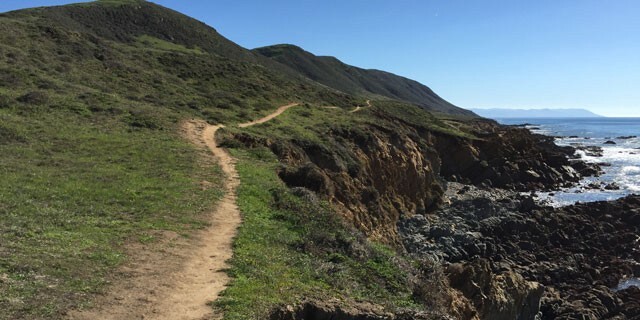 As you head north on Highway 1 Discovery Route, check out Leffingwell Landing and the Fiscalini Ranch Preserve Nature Walk, with about six miles of trails, accessible from Moonstone Beach, just outside of Cambria. A highlight run, especially as a shakeout because it is relatively flat and short, is in Harmony Headlands State Park is just shy of three miles south of the blink-and-you-miss-it town of Harmony. The trail heads west from the trailhead and then along the ocean with its ribbon-like undulations that just pull you along and make you feel as though you are in the Scottish Highlands. If you like boardwalks, Moonstone Beach offers a great out-and-back that affords Pacific views, ones that, upon sunset, are so compelling they normally halt traffic. The wood planks make for a resilient running surface that will lull you into picking up your pace, as do the waves breaking below. To continue reading please visit backcountry.com. Visit RaceSLO.com to for upcoming events and to register today. Established in 2010 to bring world class sporting events to the beautiful California Central Coast, the Race SLO family of annual events currently includes the SLO Marathon + Half and Family Fitness 5K (Spring), SLO GranFondo (Fall) and SLO Ultra at Wild Cherry Canyon (Fall ).